Regency Centers announced this week the achievement of LEED Silver Certification for The Village at La Floresta, in Brea, California. This accolade adds to Regency’s already substantial list of sixteen LEED Certified developments, further establishing the REIT as an industry-leader in sustainability. The project’s highly desirable in-fill location promotes community connectivity, walkability and enables residents to reduce emissions and vehicle miles travelled. The buildings’ high-performance design will reduce annual energy consumption by 448-megawatt hours – providing significant benefits for tenants – while also avoiding over 450,000 lbs. of greenhouse gas emissions each year. Native and drought-tolerant landscaping and high-efficiency plumbing fixtures will reduce water consumption over 260,000 gallons annually – of critical importance given the extreme drought in Southern California. Regency’s construction team also implemented a robust construction waste management plan resulting in the recycling of over 360,000 pounds of construction debris and refuse. 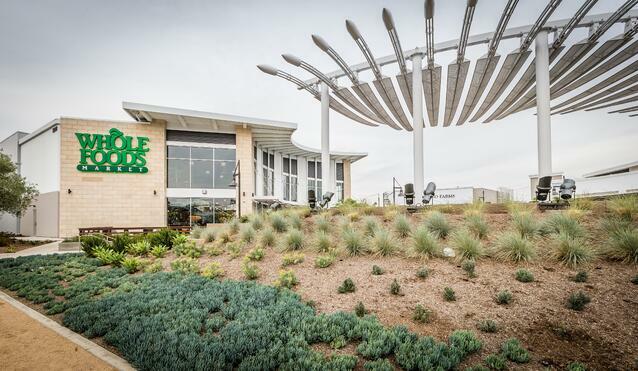 The Village at La Floresta is a ground-up development anchored by the first Whole Foods Market in North Orange County.